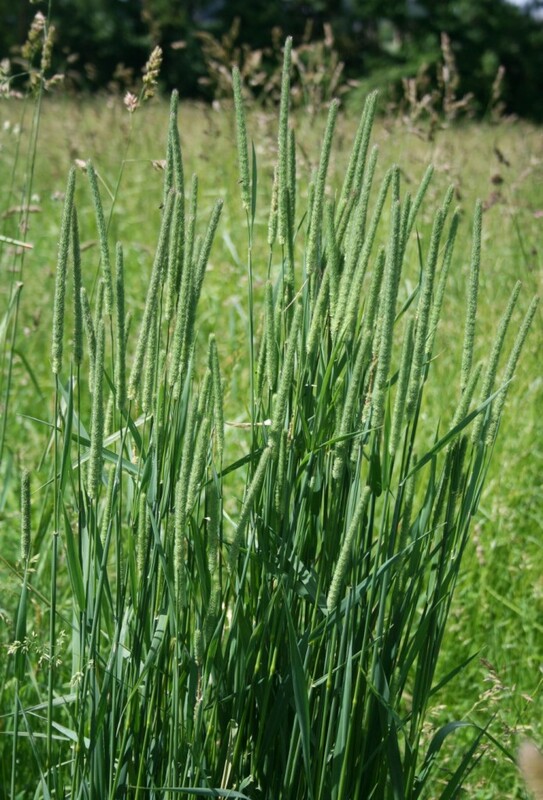 Phleum pratense is a perennial C3 grass (Waller and Lewis 1979), 50 cm to 1 m tall, stem bases bulbous, plant rather pale blue-green, later turning tan. Leaves flat, 0.5-0.8 cm wide, margins rough. Flower spikelets 1-flowered, flat, glumes truncate, short-awned (Foxtail grasses have longer awns and appear hairy, much less dense); inflorescence cylindrical, 5-10 cm long, 0.5-0.8 cm wide, usually erect, very dense, narrow, papery-textured, pale tan; blooms June-July. Habitat: Open areas, along roadsides, edges, meadows, soil pH 5-7.8, moderately tolerant of fire and shade, intolerant of drought and salt (USDA, NRCS 2010). Notes: Formerly cultivated for hay. Often infected by the endophytic fungus Epichloë typhina (Clavicipitaceae, Ascomycetes). The fungus may help protect the plant from herbivores but may also render it sterile by replacing seeds with fungal tissue (Clay and Leuchtmann 1989; Schardl and Leuchtmann 1999).